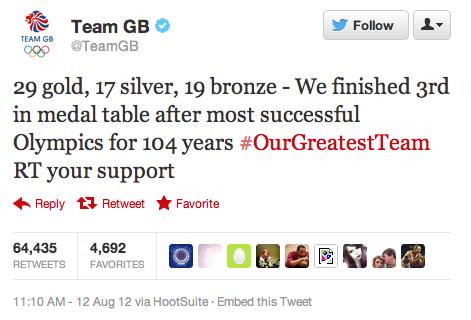 For the past two weeks, we’ve been tracking – and analyzing – tweets about the 2012 Olympics. We’ve talked about sponsors and athletes and exciting match-ups. 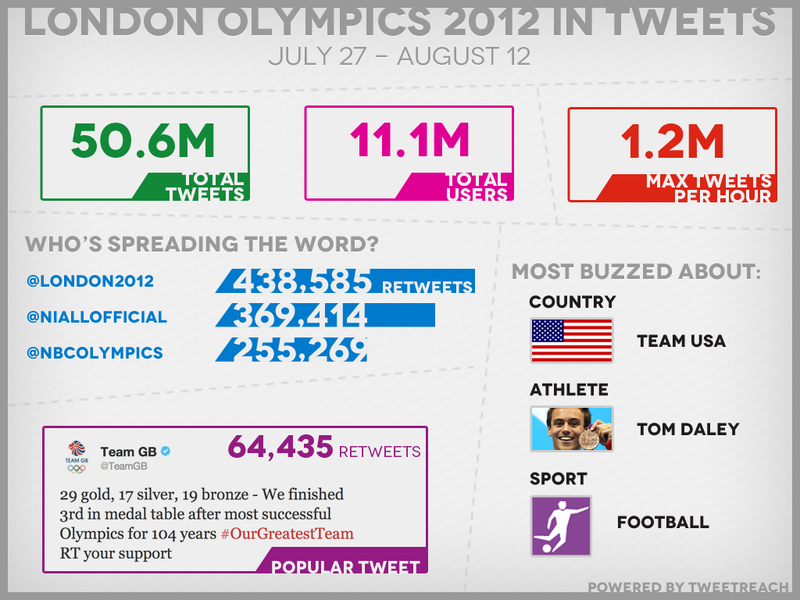 And now, here are a few final Twitter stats from the London Olympics. From July 27, 2012 through August 12, 2012 – opening ceremony through closing ceremony – we tracked 50,643,268 Olympics-related tweets* from 11,070,485 contributors. That’s right, 50 million tweets in just over two weeks! The largest Twitter spike included 1.2 million tweets posted in a single hour on July 27 during the first hour of the Opening Ceremony. The most buzzed about Olympic sport was football (soccer!) with 2.8 million tweets. The most buzzed about 2012 athlete was diver Tom Daley from Great Britain with 630 thousand tweets. And the most buzzed about country in this year’s games was the United States, which ended the Olympics with 104 medals and more than 5.4 million tweets. If you’re interested in analysis of any Olympics-related tweets, just let us know! *Our tracking included full-fidelity coverage of any mentions of a few dozen keywords related to the Olympics, London 2012, and official Twitter handles and hashtags, posted between 2012-07-27 00:00 UTC and 2012-08-13 07:00 UTC. Let us know if you have any questions about our methodology.